Dr. Tami Lawrence Buck is a school-based occupational therapist for children pre-K through eighth grade with three Department of Defense Education Activity schools in South Carolina. She is also the co-founder of Lowcountry Autism Foundation, a nonprofit organization that provides free evaluations and services to families in South Carolina. She also developed and teaches the university’s Autism course. 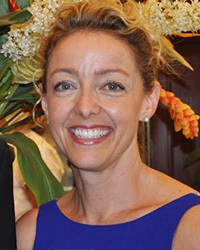 Earlier in her career, she was the owner of Hilton Head Pediatric Therapy Center and an occupational therapist in school, home health, community health, and hospital settings, including at Johns Hopkins Hospital. She also taught for two years at the Medical University of South Carolina. She is a member of the American Occupational Therapy Association and the South Carolina Occupational Therapy Association, where she chaired the board of their Sensory Integration Special Interest Section. She has national certification from Sensory Integration International (SIPT) and the National Board for Certification in Occupational Therapy. Her specialized training includes Sensory Processing Mentorships, Handwriting Without Tears, Integrated Listening Systems, Brain Gym, and the Autism Diagnostic Observation Schedule.